We all know that the Bruins are currently being decimated by the injury bug during the month of November. To quickly recap, those currently missing from the lineup include; Patrice Bergeron (rib and sternoclavicular injury), Zdeno Chara (knee), Brandon Carlo (upper body), Urho Vaakanainen (concussion), and Charlie McAvoy (concussion). Recently defenders John Moore and Kevan Miller also missed some time, and after their game against Toronto on Monday night it seems that Miller may be lost again for at least a couple more games. So with many fans who had previously holding hopes for a deep playoff run now jumping ship, please stop and take a deep breath and relax. Now, I am not saying this team is going to run off and win the Stanley Cup this season, but what I am saying is these injuries will ultimately help this team in their quest for multiple cups in the long run. Since the season started, the Bruins have had massive production from their top line of Bergeron, Marchand, and Pastrnak. With Bergeron on the shelf for a month plus, Cassidy was forced to shake up the lineup try to spread out some of their goal scorers. With his first move of putting Nordstrom on the second line center, he sent a clear message to Jakub Forsbacka Karlsson that he had to earn his spot in the lineup after his call-up to provide reinforcements. Clearly, Nordstrom playing as the second line center wasn’t ever going to be the long-term answer, but it gave the young JFK a chance to earn some stripes being paired with Heinen and Bjork. As shown above, he was able to get on the scoreboard with a different line (compiled of Acciari and Heinen) which started him to play well enough and a consistent enough two-way game that he has since been moved up to fill in for the injured Bergeron between two of the leagues most dangerous scorers. Lately, he’s brought the level of intensity the team was worried was missing from his game on a night-over-night basis that saw him sent to Providence at the end of the preseason. Now, holding his own, he has answered the question that he can be this teams third line center over the next few seasons and if he continues to play this way will show that he can be a solid second or first line center in the future (depending on who else this team keeps moving forward). In trying to get some players back in their stride and while not trying to lose anything offensively, Cassidy has left no stone unturned. He has even gone so far as putting Jake Debrusk on his off wing, something he had never done in his career. Although there were some minor growing pains for the first couple of games, the second year forward proved that he has the flexibility to play well on either wing on any line in this lineup. He is now up to 12 points in 24 games this season and has been scoring at a Pastrnak like pace as of late. Pulling out all the stops to get everyone in the lineup on the scoresheet consistently, Cassidy even tried – for a second time this season – putting David Backes back at the center position to try to get him going. Although finding his way onto the stats sheet, now up to 3 points on the season – thanks to a goal and assist in the November 24th game against Montreal – Backes is still proving to be the weak link of this team. How much longer he remains in the starting 20 remains to be seen, but with his leadership and $6 million cap-hit Cassidy is under a lot of pressure to get the veteran forward producing like his St. Louis days. Even though coming into this season there wasn’t much in the way of questions when it came to the defense of this team for this year, there were many questions being asked about the years to come. With only newcomer John Moore and rookie Urho Vaakanainen as the only defenders set to be under contract past the 2019-2020 season with any NHL experience, the questions were rightfully starting to be asked – after all how much longer can this team rely on 41-year-old Zdeno Chara to keep playing? With injuries on the backline to start the season, Matt Grzelcyk was clearly going to get his chance to show his talents, and he has not wavered in doing so. Gryz and many other youngsters have had a chance to showcase their talents at the NHL level this season as the black and gold have seen a total of 12 different defensemen so far this season. So far every one of these 12 guys, regardless of their age, has shown this season that they are able to get the job done at the NHL level to some degree. Now, I’m not trying to rewrite the defensive depth chart, but the growth we have seen in the games of Clifton, Lauzon, Zboril, Grzelcyk, and Vaakanainen show that this team has more depth than we originally thought. Although no one wants to see any player get hurt, these young players that Sweeney and his staff have brought in are clearly on the right developmental track. This will bode well for this team this season as none of the injured players are in a situation where they have to get rushed back from their injuries. Bergeron and Chara, especially, could really use the extra time off as their bodies have taken regular beatings over their careers and unless this team starts to freefall in the standings, these two can take some time to make sure they are 100% healthy to go into the playoffs. If you are looking to check out any of the Bruins games this season (or any of your other local teams) check out what our advertising partner has to offer. CHECK OUT www.seatgeek.com and be sure to use the discount promo code: BNGP to save on your purchase!!! The three most common players that I hear fans demand to get moved are David Backes, David Krejci, and Tuukka Rask. All the time it’s “he’s garbage,” “trade him for a bag of pucks,” “he’s so overpaid, it’s time to move on.” I completely understand the frustration with these players and the sentiment behind these thoughts. Some fans, however, need to gain a better understanding as to why these moves haven’t been made and are very unlikely to be made moving forward. Let’s take a look at each player and the pros and cons of moving on from each player. David Backes has been criticized for his performance since the day he signed his 5-year $30-million contract in Boston. Looking back, the deal made a lot of sense. Backes was coming off his 10th season in St. Louis, which saw him post 45 points over 79 games. Only 31-years-old at the time, and having just had two 50+ point seasons in 2013 (57 points) and 2014 (58 points), there were no signs that the Bruins were going to get a player who would drastically decline in performance. As a veteran winger, with a scoring touch AND the ability to play the center position if required, Backes seemed to be the perfect fit for a team that was looking to build secondary scoring depth and adds to its core group of leaders. Now, a couple of injury-plagued seasons later, Backes is pointless over his 12 games played. So far Backes has been given numerous opportunities to try filling the void left at the third line center position when Riley Nash departed for Columbus during the offseason. After not being able to keep that position, and having since been moved to the wing on the fourth line, what are the options Boston has to rid themselves of Backes and his $6-million cap hit? Ideally, Don Sweeney would be able to pick up the phone, make a few calls, and find a team that would be willing to take Backes and his contract. Doing this would ultimately lose a lot in return and be a “50-cents on the dollar” type deal; however, it would also be addition by subtraction for Boston. Well, for a multitude of reasons this can’t and won’t be happening any time soon. First and foremost, Backes has a full no-movement clause in his contract through the end of this season. This means that in order for Sweeney to move the veteran, Backes will have to voluntarily waive this clause of his contract and approve the trade. Aside from Backes having no reason to approve any deal, this option is further complicated by the fact that there are select teams who could even afford the hit to their salary cap by bringing in the 34-year-old veteran. This list of teams gets even smaller when you eliminate all the teams who aren’t looking to shake things up just yet because they still feel they are in their playoff races (as pointed out by Court Lalonde on last week’s Black N’ Gold Hockey Podcast episode 106, follow him @courtlalonde). Case and point, there are a minimal number of teams who Sweeney could even try to work a deal with and almost all of them would not be a situation Backes would waive the NMC to go to. At this point, to even get another team to not hang up the phone on a deal involving Backes, they will also look to get a top-level prospect in the deal as well. The NMC clause in Backes’ contract turns into a Modified No-Trade Clause at the start of next season, which will probably be a better time to look at a move. At the start of the season, Sweeney will get a list of 8 teams that the NTC is waived for at the start of the season which at least will give him an idea of where Backes true trade value is – no matter how much further it can plummet during the season. Since we’ve established that Sweeney can’t just up and trade Backes. Some of said “well they didn’t trade Matt Beleskey until after he was sent to Providence, so why not stash Backes down there then?” seems like a good solution right. Well, again I refer you to his No Movement Clause. Aside from being able to veto a trade, this clause also gives Backes veto authority on when it comes to being placed on waivers. It would take a lot from Sweeney to convince Backes to be ok with experiencing waivers for the first time in his career, and as bad as Backes has been it is unlikely that he clears without getting claimed. With a handful of teams being able to take on the cap hit, there is most likely at least one team who would try to take on a reclamation project on a player of his caliber if they don’t have to deal anyone away to do so. Going this route, although seemingly the best option right now, would be fought hard by the players union and Sweeney better be ok with receiving nothing in return before committing to this. So, why not buy him out? You did that to other mistake contracts like Jimmy Hates and Dennis Seidenberg (both of whom you’re still seeing hit your salary cap by the way). This is also the only move that the No-Movement Clause does not cover. So is this a viable solution for the Bruins to look into? It was discussed during this week’s show by the crew, and as Court, Mark, and Rob discussed if Backes gets bought out right now then his cap hit will be $5.67 million, $3.67 million, $666,667, and $666,667 over the next four seasons. This seems like a great option as it does save a few bucks from his current cap hit and a considerable about 3 and 4 seasons from now. With 22 players hitting one form or the other of free agency over these next two seasons Sweeney is going to need to save more than $333,333 and $2.33 million to really make it worth buying Backes out now. It may be worth revisiting next season if you can resign Heinen, Acciari, Carlo, and McAvoy during this offseason and then minimize his remaining cap hit from $6 million to the $3.67 million when you need to resign DeBrusk, Bjork, Norstrom, Wagner, Grzelyck, Miller, Lauzon, Halak, and Krug all in one offseason. At this point, Sweeney and the Bruins are all but stuck with David Backes, barring him deciding to walk away from the game. With the recent call-up of Jakub Forsbacca Karlsson, it is clear that his chances for the third line center is over and now he needs to fight for his job on the fourth line. Since I don’t see this resulting in a major spark in scoring for the veteran forward, it would appear that he will be stuck in Boston through the end of his contract and will constantly be fighting for ice time. I get it – he’s the highest paid player on the team, but really can we chill out with the complaints about David Krejci? Admittedly he got off to a slow start this season, and with only 2 goals it seems like he is not producing enough for his $7.25 million cap hit. This is very deceptive as Krejci was kept on this team to be a facilitator and help set up his wingers to score. His career stats show that he has never been a major goal scorer; he has 407 career assists to only 176 goals throughout his career. He relies so heavily on the other guys he is on the ice with to finish that when they don’t score he looks bad. Now that his linemates are starting to find the back of the net more, Krejci has found himself with 15 points over his 17 games. With a full No-Movement Clause of his own through the end of this season, you are very much in the same position with him as you are with Backes if you wanted to move him. His NMC gets modified to a full No-Trade Clause for the last two years of his deal which would all for waivers and a buyout as options in the future. Being that he is still producing almost a point per game at times there is no way he clears waivers and the second you buy him out someone else will gladly take him on their team. Krejci could get moved in a trade with a prospect to get a very solid return, but right now this team has issues filling its center position on the third line they do not need to add a second line center to its list of openings as well. Recently Cassidy has started to pair him back with Pastrnak once in a while, and this has shown that Krejci still has his game when paired with the right linemates. Be patient and let Cassidy find the right person to pair with him because when all is right, Boston still has one of the top one-two center combinations in the league. Now for the most polarizing of the three players. Now, this is NOT a debate over whether he is elite or not – for that debate you can visit Spencer Fascetta’s piece Is All This Rask Hate Warranted From Bruins Fans. Whichever side of the debate you align with more the result is the same. You have a 31-year-old goaltender taking up $7 million of your salary cap, who is capable of being a Vezina winning caliber goaltender, and you have questions as to whether or not he can back you to a Stanley Cup victory. First, let’s look at the trade option. If you even wanted to trade a goaltender who was tied for 7th in the league with 34 wins just last season, fine – let’s see how that would work out for Don Sweeney. First and foremost, there are a limited number of teams who blatantly need a new starting goaltender; so trading him has minimal options at best. With his contract boasting a modified No-Trade Clause for only 8 teams, good luck getting all eight teams most needing goaltending on that list. These minimal options make a trade a very bleak looking option, and with a few teams very much in need of a solid netminder, there is no way that Tuukka would clear through waivers and make it to Providence. So with a trade essentially off the table and getting him to pass through waivers being impossible, the last option to rid yourself of Tuukka’s contract would be to buy him out. Although his buyout is certainly better than that of Backes and Krejci, this is not a good decision. Although his cap hit would drop from $7 million for this year and next to a minimal $2.67 million this option is the worst of the group. First off, you would carry the $2.67 million cap hit through the end of the 2022-2023 season, AND you make him free to sign with any other team he would like. Neither benefit this organization for this season, or any season in the future. So, to recap; none of these three guys have great options to remove their cap hits for this season. It does look like both Krejci and Rask are players you can still get some production and value out of for this season. Backes seems to be the weakest link on this team and Jeremy Jacobs better get used the idea of seeing $4 million (his actual pay) sitting on the 9th floor of the TD Garden. With more lineup shakeups coming during the remainder of the season, Backes should expect to continue seeing time on the 3rd and 4th lines. Should Backes not be able to find the back of the net then Jeremy Jacobs better get used the idea of seeing $4 million (his actual pay) sitting on the 9th floor of the TD Garden. With the timetable of only “the next few days,” the call-up of Vladar makes a lot more sense than bringing up 26-year-old Zane McIntyre. If the call had been for McIntyre, the Bruins would have to submit him to waivers upon Tuukka’s return to get back to Providence. Although he cleared the waiver process earlier this season, there is no guarantee he would make it through the second time. If the timetable for the return of the 2013 Vezina winner turns into a long-term need, then it would make more sense to swap the two prospect goaltenders so that Vladar can get the starting minutes that will prove crucial in his development. Vladar got the start in yesterdays game for the Baby Bruins as they started a series of 3 games in 3 days with a 2-1 victory over the Wilkes-Barre/Scranton Penguins. The 21-year-old posted 27 saves while recording the team’s 4th victory of the season. Providence currently sits in 8th place in the Atlantic Division with 9 points. Providence has 4 wins on the season with McIntyre and Vladar each posting 2 victories. Vladar has posted the better goals-against average (2.52 to McIntyre’s 3.86) and the better save percentage (.909 vs. McIntyre’s .826). The P-Bruins have a game tonight in Bridgeport and another tomorrow at home against the same Wilkes-Barre/Scranton Penguins. McIntyre will start both of these games while Vladar will back up 33-year old veteran Jaroslav Halak as the big club takes on the Toronto Maple Leafs tonight and the Vegas Golden Knights tomorrow night. The promotion of Vladar has sent a ripple effect down the organization as it left the Baby Bruins with only 26-year-old Zane McIntyre to play goal during their current stretch of three games in three days. They have since called up another goaltender from the Atlanta Gladiators; Sean Bonar. While Bruins brass and Tuukka’s teammates have been sticking to what seems to be a short-term timetable it appears the former 75th overall draft pick from 2015 will only spend the weekend with the big club. However, with 8 games over the next 14 days including 3 sets of back-to-backs AND a 4-game road trip with stops in Colorado, Dallas, Arizona, and Detroit one thing remains certain; Bruce Cassidy is going to need a goaltender not named Jaroslav Halak to play a game at some point in the next two weeks. If Vladar gets forced into action because Tuukka takes more time than originally thought, the likely start that the top goaltending prospect will get would be in Arizona on November 17th. Should he see an NHL game or two, Vladar will have a chance show how his development is coming along and will be able to start giving Sweeney an idea of how he will want things to play out all of his goaltenders hit free agency over the next three seasons. Don’t forget to visit www.seatgiant.com and use promo-code BNGP to get your tickets to see the Bruins live at the TD Garden! Coming into this season, there were only a couple of question marks when it came to who would be on this Bruin’s roster. 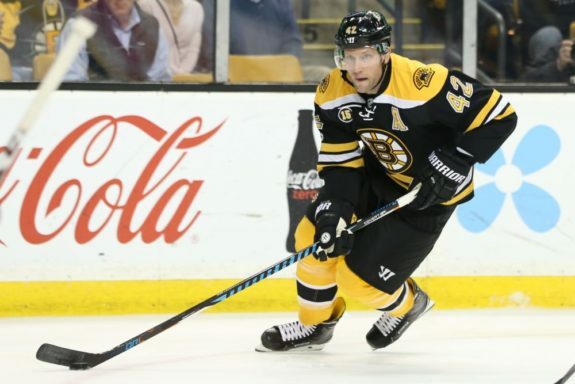 One player, in particular, David Backes was primed to play a key role for the Bruins as he is taking up $6 million of the cap space allotted for the black and gold. With the top line solidifying their positions from last season, Jake Debrusk and David Krejci played themselves to another “must keep together pairing” last year as well. With many players going to get a chance to play next to them, it was clear after a miserable opening night against the defending champion Washington Capitals that solving the open line spots would prove to be a difficult test. It did not improve much improvement the next night in their game against Buffalo when it became clear that center Sean Kuraly was overmatched being on the third line and that as versatile as Noel Acciari has been he is best suited for the right wing role on the fourth line – not at center. After being on the right wing during the first two games, where he has played for much of his career, Backes was slid over to the third line center role to start off the third game of the season when Boston faced off against Ottawa. Backes was slotted into this role for the next five games, before taking a hit from Edmonton’s Matt Benning. During these five games, he proved to be proficient in the faceoff dot while failing to get himself on the scoreboard. The question about Backes now is how effective he will be upon his return to the lineup? With his season last year ending because of a concussion suffered from a hit by J.T. Miller hit, Backes has a history of injuries and in particular head injuries. With Backes now missing time, newcomer Joakim Norstrom – whose performance had him placed on the Krejci line – is now being forced into third line center duties. 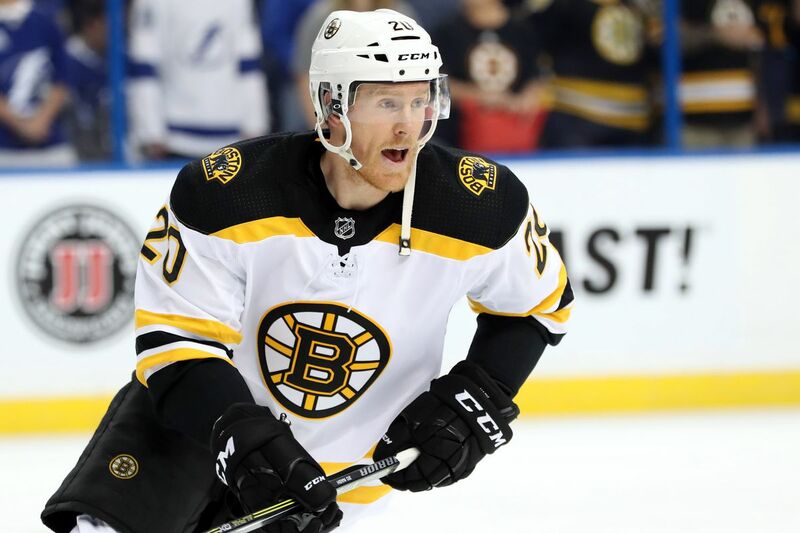 To his credit, wherever they have played the 26-year-old veteran, he has given the Bruins solid play and looks like he will be their next Riley Nash. 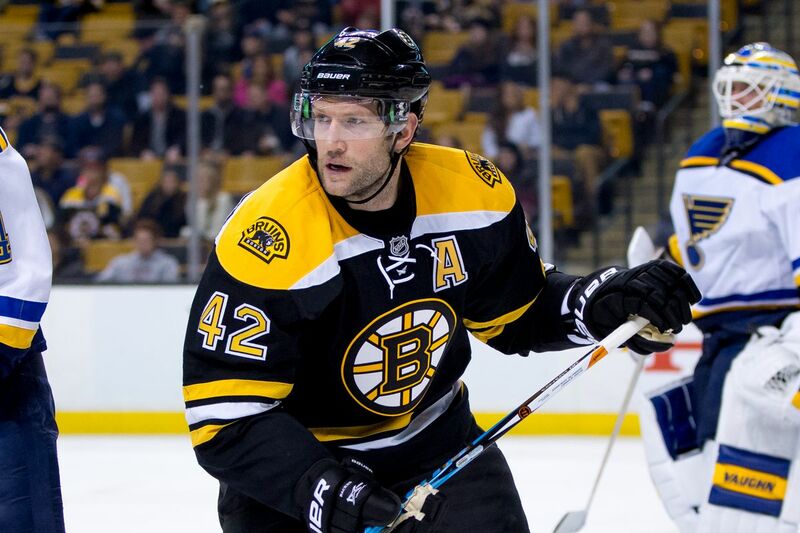 The question now remains about David Backes for when he returns from injury. To his credit, Backes re-evaluated his game and body structure during the offseason and took it upon himself to slim down and get quicker as he shed about 10 pounds in the offseason. During the preseason, anyone could see he was quicker and slightly more agile – however, during those games he was on the right wing. At this point, we have enough of a sample size to know that David Backes should not be playing center. The only remaining question is; when he gets fully healthy is he still one of their best options on the right wing? Although this remains to be seen, the Bruins have reached a point that it is critical that Backes start putting points on the board as the secondary scoring on this team is lacking in so many ways. If his streak of games without a point continues upon his return, then Don Sweeney will quickly be looking at the waiver wire for the 34-year-old. Although exposing such a veteran player and leader to the waiver wire sounds like a very risky move, especially this early in the season, in this case of Backes there is, in fact, little to no risk for Boston. To begin with, there are only 14 teams currently with enough cap space to even take on the $6 million albatross contract that comes with Backes and most of those teams would rather spend their cap money on their own soon to be RFA’s or one of the big name UFA’s who hit the free agent market after this season. Should he get claimed, then it solves Sweeney’s longer-term question about what to do with him next season, but when he makes it through to Providence, he will free up another $6 million bringing them to almost $10 million in usable cap space for the remainder of this season. Sending the underperforming veteran down to Providence (or letting him get picked up by another team), opens the door for his roster spot to be taken by one of the younger players who is still working towards hitting their peak performance. As much as I too want to see the turnstile of wingers next to David Krejci stop turning, Danton Heinen is much better suited for the third line and seeing if either Cehlarik or Senyshyn can fill that void could really help the secondary scoring this team is lacking. Sweeney has shown that he is not afraid to put a veteran like him on notice as he did so with Matt Beleskey back in 2017. Backes does deserve a chance to come back from this injury. However, that doesn’t mean that Sweeney and Cassidy should give him a long leash for underperforming. So we’ve already established the fact that Don Sweeney had a near complete rebuild to undertake when he took over the position of Bruins General Manager. After trading away some popular veterans and having some rocky times through free agency, Sweeney found himself with some low-risk veteran players, and a number of draft picks in the early rounds over a number of seasons. With a clear strategy of “draft and develop,” the most defining aspect of Sweeney’s career as GM for the B’s organization is how well do the players selected on draft day ultimately perform/pan out. Knowing that none of his draft selections have had a complete career, we can only assess the players based on their performances at their current levels and where they stand in regards to an NHL roster spot — regardless of which organization they are currently with. So how has Sweeney fared so far in this most crucial aspect of his position? Even though the 2016 draft was the first draft where Sweeney carried the “General Manager” title, the 2015 draft was the first one that Sweeney really had a hand in the players who were chosen. So going to back to the first draft Sweeney heavily participated in with this organization, how has he performed and where are his draft selections now? After some wheeling and dealing — combined with some down seasons for the Flames and Kings — Sweeney found himself with three consecutive picks in the first round along with three picks in the second round for the 2015 draft. Many felt that a combination from the six picks in the top 61 would be enough to boost Boston about 8-10 picks higher in the first round so they could select the top defensive prospect Noah Hanifin, a native of Norwood, Mass. Unfortunately, none of the teams above them were willing to help Sweeney in such a manner — causing Hanifin to be selected 5th overall by Carolina. Sweeney thus found himself with three consecutive selections to make. Jakub Zboril, Jake DeBrusk, and Zach Zenyshyn will forever have their careers linked to one another as Sweeney picked each one at 13th, 14th, and 15th overall. Senyshyn has been a bit derailed in his development due to various injuries, however, he along with Zboril have shown great strides in their growth and both competed for spots on the NHL roster this season. Even though they are both starting in Providence, they will be able to offer great depth this season and as veteran pieces start to fall off the roster to free agency. Debrusk, on the other hand, posted 43 points over 70 games last season and won himself a spot on the second line next to David Krejci. The biggest surprise from this group came from 20-year-old Brandon Carlo stepping up in the 2016-17 season and stealing a top-four spot on the blue line fresh out of the draft. Coming out of a seven-round draft, any general manager would be thrilled to have two NHL regulars and two future NHLers only three years later. Sweeney, on the other hand, put himself in a better position than that by having six remaining selections. With those other selections, he chose Dan Vladar, who is showing incredible growth at every level and will be a regular in Providence with Zane McIntyre this season and will most likely surpass him as the next NHL goaltender behind Rask. If his development path continues as it has been over these past 3 years, it is clear that he currently stands as the heir apparent to Tuukka. Lauzon also has shown consistent development and growth even though he was quickly designated for Providence out of the preseason, there is currently a nice logjam on this team along the blue line that means Lauzon can focus on fine-tuning the finer points of his game and wait for his chance to steal an opening in the lineup. With Forsbacka-Karlsson and Gabrielle joining Zboril, Lauzon, Senyshyn, and Vladar in Providence, this would be a fantastic draft (despite the recent attitude problems they may be dealing with when it comes to Gabrielle). Staying off the radar have been Hughes and Becker have been playing their game in the NCAA while Hughes joins the Baby Bruins for the first year of his ECL this season. Compile these strong, young players with the future picks that Sweeney and the organization will make, some will certainly be moved for picks and other pieces – that won’t mean they were bad draft picks. After having (and making) 10 selections during the 2015 draft, having only six selections in 2016 seemed like so few in comparison. After finishing up his career at Boston University, 1st round pick Charlie McAvoy skipped over Juniors and the AHL as the Bruins had to dig deep into their blue line depth during the playoffs in 2016-17. This caused them to burn the first season of McAvoy’s ELC. His 3 points in 6 games and average 26:12 of ice-time during the playoffs, was enough to prove that even at only 19 years old he was ready for the NHL. Now that he is a top-pairing defenseman, partnered with Zdeno Chara, and his abilities on the power play and 5-on-5 have solidified him as an anchor on this blueline for many more years to come. Like JFK and Studnicka, Trent Frederic performed admirably in the preseason this season while vying for the third-line center position. Ultimately, like JFK, he was sent down to Providence, but Frederic proved that he too is not far from being ready to make the jump to the NHL level. With Bergeron and Krejci having 4 and 3 years remaining on their contracts JFK, Studnicka, and Frederic all have the ability to take their time and develop their game without the pressure of needing to be NHL-ready right now. Even if Clark, Koppanen, Lidgren, and Steen don’t develop as projected, this draft would already be a success for Sweeney as McAvoy and Frederic look like they will be key pieces in the NHL for many more seasons. I don’t see all four of these guys making it to the NHL in a Bruins sweater as there is so much competition in the organization. That means they could be dealt away for either draft picks or in a package for veteran talent. So far from this draft class, the first three picks Sweeney made are really standing out, and this group is being led by Jack Studnicka. At only 19, Studnicka put himself in the running for the open third-line center position after just five games in Providence last season. In his three seasons with the Oshawa Generals, Studnicka has scored 26, 52, and 72 points while playing in 62, 64, and 66 games played, and he has averaged slightly more than a point per game for most of his career at all levels. Although he made a great push for the open third-line center role this season, you can’t read too much into his being sent back to Oshawa because he isn’t even eligible to play for the Bruins in Providence. Again, when it comes to the number of people currently battling for NHL roster spots, the benefit for Urho Vaakanainen is that he can work on his game at his own pace. He has proven thus far to be a solid two-way player on the blue line, which is what the Bruins will need as more defenders are due up for contracts. The 19-year-old defender moves the puck well and makes quick decisions and will have at least one season in Providence to fine-tune the skill set he already possesses. His progression has allowed him to make the roster going into this season as Torey Krug will be starting the season on IR with a re-aggravated ankle injury. Swayman, also only 19 years of age, is working his way through the University of Maine and his progress made the Bruins confident enough in their depth between the pipes they subjected Zane McIntyre to waivers earlier this preseason. McIntyre cleared through the waiver process and will split the time with Dan Vladar as projected; however, his clearing waivers could be a case of an unwritten rule between GMs to not claim other teams waived players as they cut down to 25 players going into the season. If he gets called up during the season to replace an injured Rask or Halak, I’m not sure McIntyre clears waivers again. Sweeney made it clear going into the draft that he was going to try to swing a deal to obtain a 1st round pick as he was without one going into Dallas because of the deal that brought in Rick Nash. Having the fewest picks of any draft to date, Sweeney was able to steal Axel Andersson and Jakub Lauko. Out of nowhere, Lauko was this season’s Brandon Carlo, and at only 18, he made the roster out of the preseason. Lauko is able to play the left side and the center positions while offering solid skating, speed, and a shot that can find the back of the net. 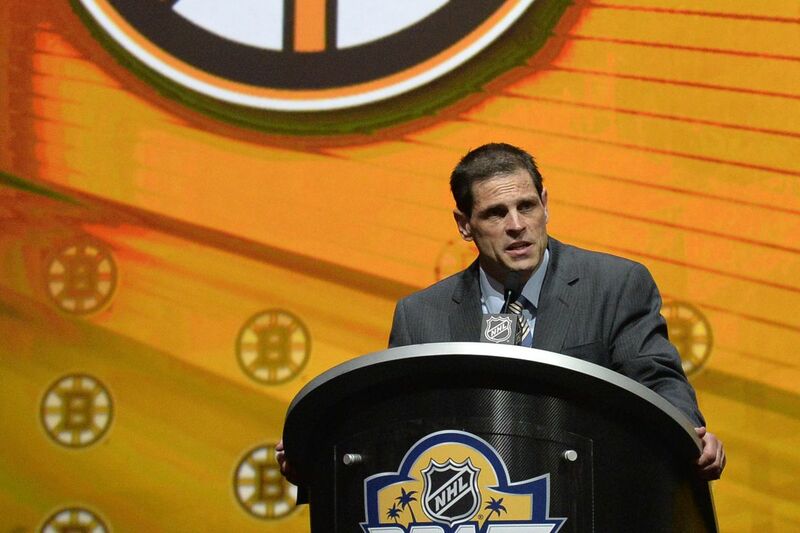 To recap; Don Sweeney has drafted a total of 27 players across his four drafts with the Boston Bruins. Of the 27 players, he already has FIVE players in the NHL with McAvoy, Carlo, and DeBrusk playing crucial roles on this Bruins team, with another 10-12 players who are vying heavily for NHL roster spots or will be over the next year or so. Presuming none of the other players develop their talents fully (an unlikely possibility) that would put Sweeney at having found 15 NHL players (let’s be conservative) out of 27 draft picks. That would be a success rate of about 56%. Although that doesn’t seem like a very high percentage, we will certainly need to re-evaluate these draft classes in another year or two to have a final number. Given the short period of time that has passed since their selection this is an incredible draft rate to fine NHL talent, and more importantly, Sweeney has been able to identify players at areas of need before a critical moment for the organization. Over the next five seasons (assuming no trades are made) Sweeney will need to have replacements for; Bergeron, Krejci, Chara, Miller, Krug, Backes, and Rask. It would see that Sweeney has potentially been able to check off a number of these slots with the likes of; JFK, Studnicka, Carlo, Vaakanainen, McAvoy, Frederic, and Vladar. This is going to be an incredibly fun season for watching the Boston Bruins, however, it will be just as exciting to watch the Baby Bruins down in Providence as we look to see which of these youngsters can push some of the veteran players (like Kampfer, Wagner, Backes, or Nordstrom) out of a job. As we continue to dissect just how good Don Sweeney has been during his time as the general manager for the Bruins, it is important to remember that he had to rebuild a large majority of this organization while continuing to keep the team on the ice good enough to contend for a playoff spot. Sweeney also recognized that by not completely dismantling the team, he would not have a season that would earn a top 5 overall draft selection for the team. He knew Instead, he would have to take a different approach. He determined that the quickest way to bring a high volume of young talent would be to trade for it and get it through the draft. To increase his chances at the draft he knew he would need to acquire early round draft selections. Let’s take an in-depth look at the deals he has made thus far in his career and see if he has “lost” as many of the deals that fans seem to think. After taking the reigns over from Peter Chiarelli, Don Sweeney pulled off 5 trades in a matter of one week. From June 25th through July 1st, Sweeney dealt away Carl Soderberg, Dougie Hamilton, Reilly Smith, Milan Lucic, and the contract of Marc Savard. During this time he also brought in Martin Jones and after 4 days with the club, moved him out to the west coast in a deal with San Jose. Since this rapid succession of dealing, Sweeney hasn’t brought in many names of high significance until this past season when he traded for Rick Nash. With many fans being very critical of the pieces that Sweeney dealt away, let’s take a look at just how supposedly bad these trades have been. Sweeney and Neely made it clear that their plan for the rebuild was through drafting and developing. So, in these two deals Sweeney brought in a total of 4 additional draft picks for the organization giving them two selections in the first round and two additional picks in the second round. With Dougie Hamilton being so alienated that he no longer wanted to be in Boston and Carl Soderberg making it known he would test his value in free agency, these two deals brought in a lot more than they would have gotten had the two players walked during free agency. 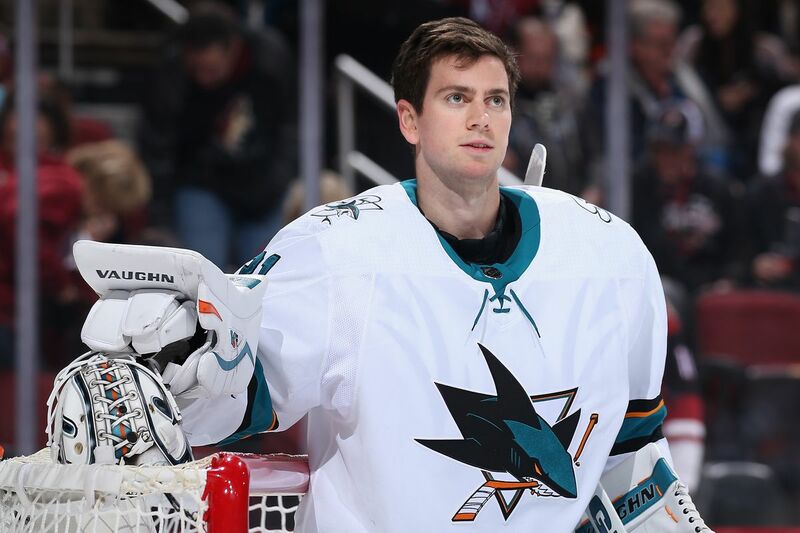 Even though Martin Jones has proven to be a solid NHL caliber goaltender, Sweeney made the correct choice in flipping the 26-year-old netminder to San Jose in exchange for Sean Kuraly and a 1st round pick in 2016. This was the correct decision because the Bruins already had Tuukka Rask locked in for another 6 years, a proven elite NHL goaltender. With only a handful of NHL experience, Jones being jettisoned for picks and a prospect was the better way to go, especially since the draft pick allowed them more options for youth and Kuraly (the prospect) could help fill a need at the center position over the next few years. Despite a very successful season playing next to Marchand and Bergeron, moving Reilly Smith was certainly a move of selling while a player was hot. His 91 points in 163 games with the Bruins was enough to package him with Marc Savard’s contract that would carry a $4.27 million cap hit. Despite being a fan favorite, it was known for a while that Savard would never skate again, and his contract would help Florida hit the cap floor that season so obtaining a 25-year-old winger who just posted 35 points in 72 games could have paid off well. After his first week of trading and dealing, Sweeney left himself with three picks in the first round and three picks in the second round of the 2015 draft. As it would turn out, the three picks in the first round would all end up being consecutive, and between the six picks in the top 61, many thought they had enough ammunition to trade up for top defensive prospect Noah Hanifin. Instead, they came out of Sunrise, Florida with six players: Jakub Zboril, Jake Debrusk, Zach Senyshyn, Brandon Carlo, Jakob Forsbacka-Karlsson, and Jeremy Lauzon. This will be a crucial season for these youngsters to prove how good Sweeney’s first week of trading really went. After his busy 2015 season, Sweeney was able to spare a couple draft picks over the next couple of seasons to bring in some veteran players to see if he could push along the young players and lead them to success. With the bleak play of Beleskey, Connolly, Loui Eriksson, and the Reilly Smith-replacement Hayes, it was clear that this team was starting to lose some fans. Sweeney brought in a couple of veterans who could help in the short term to bridge the gap until some of the young players were ready for consistent NHL playing time. Stempniak posted 10 points in his 19 games with the organization while John-Michael Liles was a key depth piece for Claude Julien to play on the blue line for 53 games. With a team that was starting to show early signs of being ready to compete for a cup sooner than originally expected, Sweeney still had veteran players who were not playing up to their full capabilities. With young players like Noel Acciari, Austin Czarnik, and Danton Heinen playing out of position, the Bruins needed a wing forward who could help relieve the pressure from the young guys. Only costing Sweeney a single, late-round draft selection, the acquisition of Stafford was a perfect example of the low risk, high reward type move that Sweeney now leans towards when it comes to veteran players. After a season that saw Sweeney and Cassidy dig deep into the farm system for defensemen in the playoffs, Nick Holden was brought in late in the season to add more depth at a crucial position as the team looked to compete in the playoffs again. The 3rd round draft pick might have been a little too high for a player like Holden. 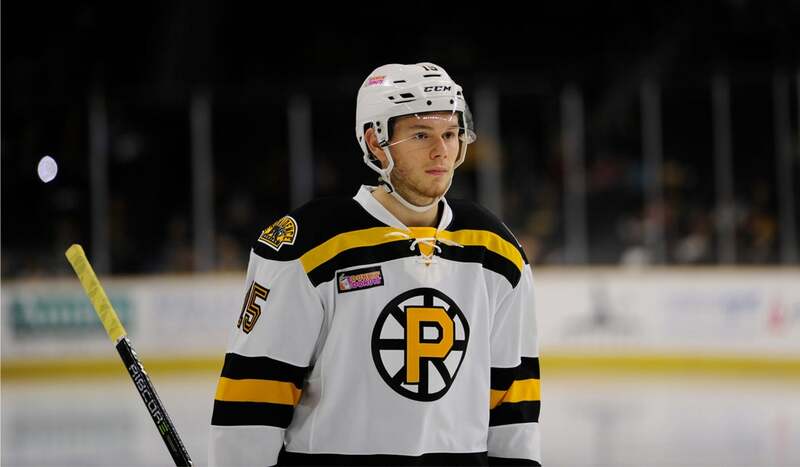 However, the loss of O’Gara was minuscule as he had never been able to make the jump from the AHL and his roster position in Providence had become more crucial for the up-and-comers. This deal, while perhaps a slight overpay, also paved the way and established a relationship with the Rangers for more trades in the future. Like Jimmy Hayes, the 23-year-old Vatrano was a native of Massachusetts. He showed a lot of promise when he was first drafted and started his way up through the system. Injuries limited the forward to only 108 games over his three seasons in Boston. After a couple of injuries, it became clear that he was consistently getting passed over by other players, so he too became expendable as the B’s organization was preparing to see an influx of young talent coming up from juniors. These youngsters are also why Tommy Wingels was not resigned after his 18 games in Boston. He provided some depth and versatility while he was here, but it was clear he wasn’t in the long-term plans for the team. The slight overpay to get Nick Holden out of the Rangers organization clearly helped get the ball rolling on more trading between the two clubs, as I alluded to earlier. This allowed Sweeney to use the value of Spooner’s built-up performance on the power play and then combine it with a 1st round pick and a late round (conditional) pick to get the under-performing Beleskey contract off the books. With only 45 points over 143 games, and a plus/minus of -12, it was clear that Beleskey just wasn’t working in Boston. With almost $12M remaining on his deal for 3 more seasons, it seemed near impossible to clear his contract as his value was so low. But, being able to subtract the Beleskey situation and bring in a top-talent like Rick Nash helped push Sweeney and his team into a long playoff run. Sweeney has made obtaining draft picks a priority during many of his trades–an area you can now see shows just how good of a job he’s been doing with the organization. The trades made have afforded the B’s GM a number of solid draft picks in the early rounds. Ultimately, it doesn’t matter what round a player gets selected in, as we know firsthand from the career-best play of No. 37 Patrice Bergeron. Once selected, all draft picks have an unpredictable road to the NHL. But in the case of Sweeney, as I’ve laid out, he’s scoring a lot more than hitting the post. As for my next post, Part III of my series will focus on how we’ll finally start to see “the big picture” of Sweeney’s draft plans and how they’ll impact the team this season and beyond. Last season (in my first article with the Black N’ Gold) I wrote a piece about Don Sweeney’s patience being a major asset to this organization during the 2017-18 offseason. Now, just under a year later, he is proving even more that he was and still is the best person for the GM position in the Bruins organization. With the moves he has made combined with the ones he is making now, Sweeney is currently setting up the Bruins to be contenders not just for the 2018-19 season, but for the next 10-plus years. During these years, Sweeney will widely be regarded as one of the league’s top general managers as well. There are many Bruins fans who will completely disagree with this thought because of certain moves he has made; so let’s take a dive into each move he has made during his time leading this franchise so far. In this series, we will examine each way he has acquired players and see just how successful he has been for this team. Clearly, free agency has been the weakness for Sweeney and his staff. However, when you look at the players they have brought in, there has been a clear shift in the type of player targeted. If you examine each free agent class year after year, it becomes obvious that they are learning from their decisions. In his first offseason, Sweeney targeted one of the biggest names on the market in Matt Beleskey and was able to land him for 5 years. At the age of only 26, Beleskey looked like he could bring to the Bruins lineup a physical style of play that the team hadn’t had on the left side of David Krejci since the days of Milan Lucic. Hayes, Connolly, Bartkowski, Campbell, Warsofsky, Lindblad, Carey, and Flick were all extended with Hayes having been brought in originally via trade (more to come on that later). The biggest flops in this class were Beleskey, Connolly, and Hayes. Although these guys never really found their game here in Boston, we are left to wonder if they would have fared better under the coaching of Bruce Cassidy instead of Claude Julien. It quickly became clear with his future signing that Sweeney learned from these problematic veterans and would shy away from them in the future. Showing a different approach than in 2015, Sweeney shifted to targeting veterans who would have to fight for a roster spot and would have to earn their keep. Khudobin was brought back after Gustavsson showed he just wasn’t cut out for the NHL level, but “Dobby” still had to beat out McIntyre and Subban for the backup role behind Rask. Moore, Morrow, and Nash were all brought in to compete for starting positions, and both Moore and Nash not only earned them but also kept their spots. In fact, Nash not only flourished in his second year with the team but also saw time filling in for Bergeron on the top line for a handful of games. With Backes signing the only contract longer than 2 years and for more than $2.5 million (his contract was for 5 years at $6 million per year), he is clearly the biggest risk in this group. Having just come off his 10th season with St. Louis, Backes posted 45 points in 79 games. With versatility and durability, Backes was clearly brought in to put with the youngsters as the third-line center while having the ability to play the wing as well. With 460 points in 727 career games in St. Louis, Backes played in all 82 games three times and at least 78 games six times, including all 48 in the locked-out and shortened 2012-13 season. After only 38 points in his first season in Boston, last season he was unable to stay healthy and ended up missing almost two months after requiring surgery that removed part of his colon. The positive note for Backes’ 2017-18 season is that he was able to post 33 points in only 57 games — a much-improved scoring rate over his first season with the club. This third season, which has seen him come into camp more lean and agile, will be the defining season of this contract for both player and GM. With a free agent class that saw big-name players like Justin Williams, Thomas Vanek, Chris Kunitz, Patrick Marleau, Kevin Shattenkirk, Alex Radulov, and even Joe Thornton, many were looking for Don Sweeney to bring in one of these top guys to fill in some of the major holes on this team. Instead, Sweeney negotiated extensions with Pastrnak, Spooner, Subban, McIntyre, Schaller, and Czarnik. With one of the league’s top right winger talents under the age of 25 now locked up for the next 5 years, Sweeney could shift his focus to the young guys in the system to figure out which ones to continue extending and which ones could be packaged together to bring in other pieces. So did Sweeney make the right decision to allow the youngsters to play instead of bringing some of the veteran names? To find out how “bad” this decision was let’s compare the offensive production from the two groups; players who Boston could have had and the players who Boston put on the ice this past season. Group A: These players signed deals as UFA’s last offseason and were mentioned as players Sweeney should pursue. Group B: This group of forwards played for the Bruins last season next to Krejci and on the third-line wing. The players in Group A put together a great season with a combined 183 points over 325 games played, giving the collective great average of 0.563 points per game. This is a very respectable figure; however, compare it to the almost identical pace of 0.568 points per game that the Black and Gold (Group B) were able to put up with the crew they put on the ice. Coming into this new season, it is clear that Sweeney wants to continue to build off the success from the young players who stepped up last season rather than spend money on big-name free agents like he did early in his career. With Kuraly being re-signed, it is clear he has earned himself a starting role as one of the bottom-line centers. With Cave and Blidh being brought back for depth in the AHL, Nordstrom and Wagner will be given a chance to win NHL roles but need to be careful because they have young guys nipping at their heels for the same NHL spots. Sweeney did manage to book meetings with the two biggest names on the market this offseason in John Tavares and Ilya Kovalchuk. With the contracts these two players received, it would have been outrageous for Sweeney to do what would have been required to bring one of them in. Kovalchuk landed with Los Angeles for 3 years and has a $6.25 million cap hit each season, and managed to get a no-movement clause for the first two seasons of the deal. Tavares received an 8-year contract with a cap hit of $11 million each season and a full no-movement clause for its entirety from his hometown Toronto Maple Leafs. Either of these contracts would have been horrendous for the Bruins to take on and would have been much more disastrous than the Beleskey contract, Hayes contract, and even the Backes contract ever could have been for this team. Sweeney may not bring in the biggest name every season, nor does he make the biggest “splash” in free agency every year. He has, however, proven that he learns from his mistakes, using due diligence and patience to ensure the free agents signed have a higher reward than the risk they carry. With the free agency side of his role clearly improving year after year, Sweeney will need to prove himself in all aspects of the job in order to put this Bruins organization in the best position for success moving forward. And as you’ll next read in Part II of this series, a top GM in the NHL like Sweeney knows that acquiring asset and players via trade can be just as effective as free agency on a team’s present and future. Where Do The Bruins Stand In The Rebuilding Process? Back in 2015, the Bruins promoted Don Sweeney to be their new General Manager and start a rebuilding process for the organization. Now that we are entering his third season in the role, it is time we start to evaluate where in the rebuilding process the organization lies. Is this rebuild going in the right direction and if not, what changes should be made to potentially “right the ship?” As fans, all we want is a team that is in the playoffs each year with a chance to compete for the Stanley Cup. With the early success in the process this past season, many would say we should be competing for a cup this season or next. So how accurate is this? First, let’s remember exactly what the team looked like when Don Sweeney took over the reins from Peter Chiarelli back in 2015. Despite being only two seasons removed from its second trip to the Cup finals over a 3-year span, the situation was a lot more tumultuous than it appeared. Peter Chiarelli had just traded Tyler Seguin and Johnny Boychuk, both of whom were expected to be big pieces in keeping the success of the organization moving forward. Seguin was a young, top-line center who proved he was versatile enough to also play on the wing as he did so next to Bergeron and Marchand with great success. Boychuk was a solid second-pairing defender who played well in his own end and brought some great physicality and a hard slap shot in the offensive zone. If these were the only two setbacks that Sweeney had to overcome the rebuild would not have been such a big deal and would be expected to be much shorter in time. Instead, he also inherited a disgruntled Dougie Hamilton, who made it known he wanted out of Boston and a completely alienated Alexander Khokhlachev. Khoko was so disgusted with the organization that he decided to go play in Russia rather stay in Boston. With other veteran guys starting to dwindle in their play, it seemed like a daunting task for Sweeney to retool this franchise and keep it competitive. Sweeney and Neely soon made it clear that the plan was to stockpile draft picks and as much young talent as possible. Between the trades of Hamilton, Lucic, and Carl Soderberg; Sweeney was able to bring in a total of seven draft selections, and all but one of them would be in the first two rounds of the draft. He also brought in young players like Colin Miller, Jimmy Hayes, Sean Kuraly, and Martin Jones in these deals — all of whom were 25 years of age or younger. Jones, Kuraly, and Miller have all proved to be solid players, and overall these moves paid off for Boston — or would have if they didn’t lose Miller in the expansion draft to Vegas or flipped Jones to San Jose. After all his wheeling and dealing was done, Sweeney ended up with the 13th, 14th, and 15th overall draft picks in 2015 along with three picks in the 2nd round. This one draft resulted in the Bruins taking home 10 players in; Jakub Zboril, Jake Debrusk, Zach Senyshyn, Brandon Carlo, Jakob Forsbacka-Karlsson, Jeremy Lauzen, Dan Vladar, Jesse Gabrielle, Cameron Hughes, and Jack Becker. So far with Carlo and Debrusk proving to be solid NHL players and Zboril, Senyshyn, Lauzen, Gabrielle, and Fosbacka-Karlsson all developing nicely, this season will be the most important for this Bruins rebuild. Right now there aren’t enough spaces for all those players to make the NHL club this season, but over the next 2-3 seasons a lot more spots will open up for them to step in. Although he wasn’t named to the general manager position until 2015, Don Sweeney was the assistant GM and mostly oversaw the development of the young players. Taking a huge role in the 2014 draft, Sweeney was a big reason why this team ended up drafting; David Pastrnak, Ryan Donato, Danton Heinen, Anders Bjork, and Emil Johansson. Heinen and Pastrnak play two of the biggest roles on the team right now, and Donato and Bjork have shown flashes of brilliance but needed a little more time to develop their bodies. Those four are projected to be on the roster for the 2018-19 season, and this type of drafting success is exactly what ANY team could hope for. Although this current rebuild is not yet complete, it is looking like Don Sweeney could turn what could have been a 5-year rebuild process and done it in only three seasons. This preseason we will give us answers on the growth and development for the remaining draft class from 2014 and 2015. Next season will show us how the remaining players from the 2016 and 2017 class will project; with successes coming from those draft classes more players could make the jump quicker than expected. Charlie McAvoy is already a top-tier defender in the NHL and Jack Studnicka, Urho Vaakanainen, and Trent Frederic all look like they could be ready for the NHL in the next year or two. The experience this team gained from losing in the Eastern Conference Final last season will prove tremendously valuable moving forward, and while we can only truly call the rebuild complete when we see them back in the Cup final again, it looks like they may fall short for another season or two, but once they get back we will see them there for many seasons to come. Casual fans of this team need to really start paying attention to what this team does on draft day because before they know it, Don Sweeney will be considered one of the top general managers across the NHL. As the start of the new hockey season is quickly approaching, it is now time for the questions and speculation about who will be on the roster this year, and who will be the one to beat the odds as a young player and compete for a roster spot on the big club. Two seasons ago, 19-year-old Brandon Carlo came out of nowhere as a 37th-overall draft choice to make the big club and earned a spot on the top pairing with Zdeno Chara. So this season, who will be the big surprise to make the roster? Which youngster will step up and make the team forcing a veteran out of their position? Not long ago my colleague, Max (@tkdmaxbjj), posted his thoughts, predictions, and projections for the upcoming season — seen here in his article Mainville’s Full 2018-19 Boston Bruins Predictions. One of his predictions includes his thoughts on the starting line combinations for the upcoming season, and although I agree with him in many areas, there are a few spots where we differ in opinion. Also, with the 20 guys in the lineup each game, who are the three guys that sit each day? One major question for this year is whether or now Sweeney will make the unusual decision to carry eight defensemen on the roster. When it comes to the starting 12 forward positions, one of the top units will consist of the second-year left-winger Jake DeBrusk getting paired back with David Krejci as last season they were extremely effective playing together. They will be rejoined by 22-year-old David Pastrnak on the right side as Cassidy has made it known this was a line combination he was anxious to get on the ice at the end of last season, but injuries and poor play altered those plans. Moving Pastrnak back down with Krejci opens up the wing next to Bergeron and Marchand. Bjork is the plan to put there, however, given the fact that he is still recovering from his injury last season it remains to be seen if he can get out of the gate with enough momentum. 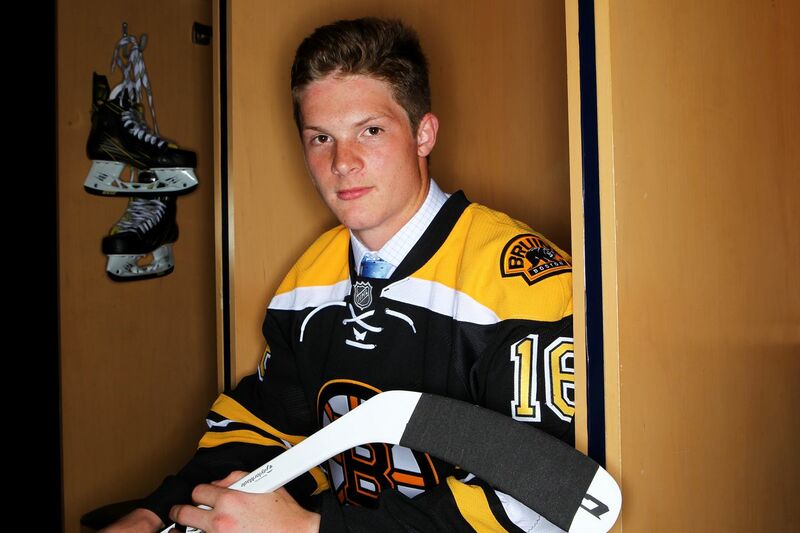 I think that Danton Heinen will start off on that unit coming out of camp. Until Bjork hits the ice this preseason, he won’t have done enough to take the top-line wing position while Heinen posted 16 goals and 31 assists last season mostly in a third-line role. Anders Bjork will have a great shot at taking the top right wing spot from Heinen but will start on the third line until he is able to show he is fully healthy and ready for NHL action. He will find himself on a line with rookie Ryan Donato on the left side as it is becoming more and more clear that the plan is to convert the 19-year-old into a left side winger. The question of who will center this line is completely up in the air and is probably the biggest question on the roster and Cassidy and Sweeney have made it clear they have no one penciled in for this role and that ANYONE can take the opening. With three of the top young prospects vying for the third line center role, at this point it is almost anyone’s guess as to who will step up and take it. I believe that the current favorite to win the job is the 21year-old Jakob Forsbacka-Karlsson. As the only one with NHL experience (albeit only one game), he is entering the final season of his ELC as it officially kicked in when they called him up at the end of the 2016-17 season. As someone who has drawn many comparisons to this team’s top centerman, his skill set will go well with that of Donato and Bjork. I think the biggest threat to Forsbacka-Karlsson taking this role will be Jack Studnicka. The 19-year-old, former 53rd overall draft selection, has averaged just about a point per game at every level he has played, and if that type of production continues, Sweeney would be hard-pressed to send the kid back to Providence. I must agree with Max that David Backes will find himself on the fourth line despite his $6 million contract. Coming into camp 10 pounds lighter should help with the speed that was lacking in his game last season, and if he is fully healthy from his colon issue and the concussion from the postseason, then he might have a shot next to Bergeron on the top line. I just don’t see him bouncing back that much, and his presence on the bottom unit will help spread out the leadership through the lineup. His partnership with Sean Kuraly and Joakim Nordstrom will prove to bring a very physical presence with a nice scoring touch. The fourth line with Backes, Nordstrom, and Kuraly could prove to be one of the most effective in the league if everyone stays healthy and plays at the top of their game. Even though he has taken a small step back, Zdeno Chara will not be separated from his current puck-moving partner Charlie McAvoy. The new 1-year contract that Chara signed shows that they are still expecting him to be every bit as good as he was last season. Cassidy does need to look for every opportunity he can find, especially during the beginning part of the season to cut back on Chara’s minutes — which has been said for the past 4-5 seasons. With Carlo and Krug healthy again this season, not only will they be the second pairing as they have since the emergence of McAvoy, they are both going to need to show all they have because both are due for new contracts at season’s end. The third and final defensive unit has certainly generated the most buzz and has only gotten more interesting since the trade of Adam McQuaid. It would appear that Kevan Miller has played his way into securing the right side of that pairing. After Cassidy took over coaching duties from Claude Julien, Miller’s play improved so significantly that he was chosen to be protected over the younger Colin Miller at the expansion draft. I wish we could see more of him playing with Matt Grzelcyk. However, I think we will have to wait until further in the season to see that. At the beginning of the year, he will be paired with newcomer John Moore, while Grzelcyk will remain the team’s 7th defenseman. Barring a major shock in camp, Boston will only carry Tuukka Rask and Jaroslav Halak to play between the iron. Although Halak has been a starter before, Rask is the clear starter for this team and Halak is meant to provide a more consistent and reliable backup than was Anton Khudobin. With Malcolm Subban being shipped to Vegas last season and McIntyre taking a step back in his development, Sweeney needed to find a veteran presence to hold down the spot until either Vladar or Swayman prove they are ready to make the big club. Should an injury to Rask or Halak occur, McIntyre is the only one of the three youngsters with NHL experience so he will get the call-up. We can only hope he would be ready by then should it be a long-term injury. As mentioned above, the team will almost certainly be carrying Matt Grzelcyk as their seventh defender leaving just two more spots open on the 23-man roster. They may opt to send him down to Providence because Zboril or Lauzen — two of the top defensive prospects closest to making the team — don’t have to clear waivers to get back to Providence. So with two more open spots, who are going to be the ones lucky enough to take these spots? First, there is Noel Acciari. He gets bumped from the starting 20 as Nordstrom has a more natural fit on the left side and he hasn’t done enough to outplay Kuraly for the center position. Acciari’s versatility to play both the wing and center he will certainly be one of the first ones off the bench should an injury occur, or a player requires a day off. The last roster spot will be given to Chris Wagner (assuming he has a solid camp). First and foremost, he was just brought in on a 2-year contract, and he would require clearing waivers before going down to Providence. Jack Studnick, Trent Frederic, and Peter Cehlárik could all put up a solid fight for the last roster spot, however none of the proven consistency at the NHL level enough to stay, just yet. Cehlárik may be the one who pushes the hardest for it. However, his injury history has really put a damper on his development and a little more time in Providence may be a good thing for him. Every team paying its players in any professional sport will ultimately have at least one contract that hurts the organization in some way. The players who are being paid on these contracts are often the ones who are most criticized either for being overpaid or for a decrease in performance. Other leagues allow for a new contract to be drawn up that could supersede a “bad contract” for the team as long as both sides agree to it. With the hard salary cap structure in the NHL, teams are often stuck with bad contracts or will often suffer repercussions for getting out of them for years after they move on from the player. The Bruins are not exempt from this and have a number of contracts currently on their books that will hurt them this season or in the coming years. Let’s take a look at five of the top contracts that are putting Sweeney and his staff in a tough predicament. Let me be very clear; even though he is 41 years old, bringing back Zdeno Chara for another season was absolutely the right decision and something that Sweeney needed to do. However, that doesn’t make his contract a “good contract.” So let’s take a look at the contract. Chara has a 1-year contract that will pay him $5 million for next season, and he will go against the salary cap for the full $5 million this season. Cassidy and Sweeney better have a strong plan in place to limit their captain and keep him UNDER 20 minutes of ice time per night. Even though he can still play like an elite top-pairing defenseman, they really need to limit his minutes during the regular season to keep him from for the playoffs. If the Chara conundrum stopped right there, then he would probably not be on this list because it is only for this season. However, there are still many questions regarding both the player and his contract. First and foremost, there is the potential for another $1.75 million to go against the Bruins salary cap for next season if Chara hits all the incentives in this contract. Also, if the team gets off to a slow start and is out of a playoff spot by the trade deadline, would they look to trade him so a younger defenseman can get the playing time? Lastly, if Chara decides not to retire, retaining him would cost more money next season in addition to the $1.75 million in incentives that could carry over. Right now, the best option is to try to send the captain off into retirement next season with the celebration of a nice large trophy while minimizing the $1.75 million next season because the $866,667 remaining from Jimmy Hayes’ contract will finally come off the books. When Krejci first signed his 6-year contract guaranteeing him $43.5 million he was one year removed from a 70 point season in which he played in 80 games. He also helped anchor the Bruins up the middle to their second Stanley Cup Final in three seasons. This deal looked like it could be a steal to have a good second line center locked up for so long — especially with a proven ability to put up a point per game in the playoffs. However, turnover on his wings combined with some injuries hampered Krejci’s ability to put up points and thus has made his $7.25 million cap hit a massive weight on their roster. There has been great debate over the past two seasons about whether Boston should look to move the centerman — who would need to approve any deal his name is involved in. Despite being able to fetch the team a massive return to help their rebuilding process, the full no-movement clause in his contract has kept Krejci in Boston despite his inconsistent play. The clause will expire at the end of this season, and it is up to Krejci to play well enough to ensure Don Sweeney doesn’t want to utilize the eight-team list he will get at the start of the 2019-20 season. At 32 years old, the Bruins’ highest-paid player has missed 30 games over the duration of this contract due to injury and has shown extreme inconsistency in his play. Although the Bruins haven’t helped him by giving him consistent wingers, Krejci’s play has fallen pretty significantly. Should the decline continue, looking to move him will look a lot more practical. However, for this season they should put Pastrnak and Debrusk — two wing players he has proven track records with — and hope that he can find his old form again. Due to the versatility that John Moore brings to the Bruins organization, it’s tough to hate this contract. In many ways, this contract makes a lot of sense. It makes even more sense when you see as the defense sits right now, there are no defenders locked up for two years from now — except for the recently signed entry-level contract for Urho Vaakanainen. Even though it is fair to assume that both Carlo and McAvoy will be re-signed, it never hurts to have a player locked up anyway. With the possible versatility that Moore brings to Boston (which you can read about in Mike Cratty’s piece The Potential Fluidity of John Moore’s Role as a Bruin), it makes complete sense to lock him up for a handful of years at the age of only 27. The main reason why John Moore’s contract makes this list is because of what it does to them for this season. Even at a very reasonable cap hit of $2.75 million per season, his contract hurts because of all the other defenders that Boston has under contract this season along with a number of young guys who are working to break into the NHL level. With guys like Lauzon, Zboril, Vaakanainen, and Grzelcyk fighting for NHL ice time, the Bruins have depth guys that need testing already in the system. With only the top four spots fully secured by Chara, McAvoy, Krug, and Carlo, there are two starting spots open for all the young guys to fight for along with Kevan Miller and Adam McQuaid. 4) trade someone currently on the roster; Krug being the guy who would net the biggest return. The option that Sweeney goes with remains to be seen — thankfully, the final decision doesn’t have to be made just yet. Adam McQuaid is a 31-year-old, physical, veteran defender who most teams would love to have on their roster. His current contract that hits the Bruins salary cap for $2.75 million each season hurts the Bruins because they have never gotten a full season of play out of the 8-year veteran. Since signing his current contract, McQuaid has missed 25% of games dating back to the 2015-16 season. Without this contract on the books, the $2.75 million could have instead gone into free agents who were available over the past two seasons – or even re-signing Jarome Iginla, who showed he had good chemistry with other guys on this team. With his current contract ending at the end of the season, the best option with McQuaid is to try to find a team who is willing to take on his full money value in exchange for a draft pick. Right now having the open roster spot and freeing up the cap space is more important for this team so either a younger player can fight for ice time, or they can bring a veteran in at the trade deadline. Giving a youngster NHL time for their development is more important during this rebuild than keeping the often-injured veteran on the squad. As much as I love to watch McQuaid as a player, he has only hit the 70-games played threshold twice in his career while remaining under 40 games played FOUR times. If the Bruins can find a trade partner it is critical to move the defender as many teams will opt not to deal for him when keeping him in Boston forces them to either carry eight defensemen, trade a younger player, or cut McQuaid allowing him to be picked up for nothing. Coming from an incredible run of posting 460 points in 727 career games with the St. Louis Blues, David Backes looked like a guy who could provide Boston with versatility and some top-six scoring ability. He found a spot on this team as he would be able to provide solid depth at center on the third line after the departure of Carl Soderberg to Colorado and the ability of Ryan Spooner to step into the role still in question. Backes found himself playing the wing on the third line instead as he no longer had the speed required to play along Krejci’s right side and Riley Nash overtook him for the center position. This found Boston paying $6 million to a third-line winger who wasn’t good enough to break into the top-six grouping. Last season, Backes had one of the worst of his career, and it wasn’t helped by the fact that he was diagnosed with diverticulitis and had to have part of his colon removed mid-season. As a result, he only played in 57 games and never truly found his game. Having watched his game decline year over year since departing St. Louis, many are now starting to question exactly what Backes can bring to the table next season. With so many young forwards bucking to make their own move to the NHL level the question now comes up: where does David Backes fit in on this team? With the top two lines only providing options on the right side, and one of those spots going to David Pastrnak, only one spot on the wing is open. Most people are penciling either Anders Bjork or Ryan Donato for that spot (while Danton Heinen may also be a solid fit as well) which would leave David Backes on the third line again. Having a $6 million player on your third line for multiple years and a no-movement clause is not a formula for sustained success. If this were their only season issue with or their last season left with David Backes, then it wouldn’t be as much of a problem for the organization. However, they are also seeing an extremely inconsistent play and a number of injuries that keep piling up. After suffering a concussion, a leg laceration, and his colon surgery last season, the Bruins have to wonder what other nagging injuries Backes suffered and exactly what he will bring to the table for this season. Sweeney can only hope that it would only cost one prospect paired with Backes for a team to be willing to bring on his salary and free Boston of this albatross contract — assuming it’s a team Backes would waive the no-movement clause to go to. Right now, the Bruins’ best option is to hope that he can find his production again while being on the third line, then look to move him at the start of next season when Backes submits his list of 15 teams once the no-movement clause turns into a modified no-trade clause. If Backes can’t find his game again, the Bruins could be stuck paying him $6 million to sit on the 9th floor while some of their younger guys help this team to succeed. Any team would give a massive haul to have a 27-year-old defenseman who can put up close to 60 points in a season. Any team who would let that kind of player walk as a free-agent would be considered insane. It wasn’t long ago when Torey Krug signed a 4-year contract that would pay him $21 million. At the time many thought this contract was a drastic overpay for a defender who is only 5-foot-9; now this contract makes Krug one of the best bargains in the league. So how does Torey Krug find himself anywhere near this list? His contract will hurt Boston because it is going to end at the end of the 2019-20 season. This may only be an issue if the younger defenders develop and progress over the next 2 seasons as many think they can. When Krug hits the market in 2020, Boston will also be looking to negotiate new contracts for Kevin Miller, Matt Grzelyk, Jakub Zboril, Emil Johansson, and Jeremy Lauzon. They will also have just given new contracts to Brandon Carlo and Charlie McAvoy in the prior season. Just how much is it going to cost to lock Krug into another contract while he is still under 30 years of age, and how long are they going to need to commit to him? Boston is not in the position that they should be considering trading one of their best defenders going into this season. The thought of trading Torey Krug this season is completely asinine as he has another year on his contract and there is no one who is ready to step up in his place once he departs. If McQuaid, Miller, and Chara are no longer in Boston in two seasons (which they shouldn’t be), then the core of the Boston defense will be two players under age of 23, plus Torey Krug and John Moore. If Boston had signed Krug to a deal with a longer term, then they wouldn’t have to worry about Krug’s contract during this crucial time during their rebuilding process. The good news is that if Sweeney does decide to move Krug going into next season, the return will be significantly higher than the price Boston paid to get Rick Nash for half of last season.